Neville asked me to comment from my perspective as (now former) CEO of Kred, and as someone who is a keen contributor to the influence debate. UPDATE: On his weekly FIR podcast with Shel Holtz, Neville extensively quotes from the post below. 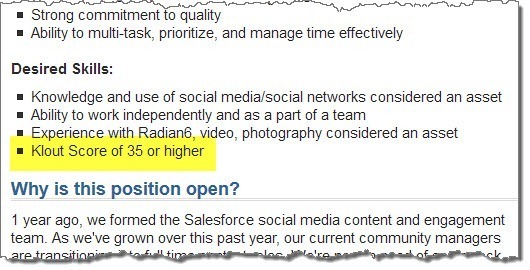 [mejsaudio src=”https://londoncalling.co/wp-content/uploads/fir-664.mp3″] What promoted his post was the news that Salesforce.com has posted a job ad for a community manager with one of the “desired skills” a “Klout score of 35 or higher”. I’ve written about the fascination with social media scores recently in a post “Why two influencer scores are better than one“. This fascination of recruiters and HR departments wanting to know your “score” started back in 2009 when Best Buy posted a job ad that stated “250 plus followers” on Twitter as a preferred qualification. The danger employers face when stipulating a social media “score” either from an influencer platform or based on the number of likes of follows, is that all of these numbers can be easily gamed. If employers take these numbers at face value as a measure of the “worth” of a potential employee, then they may be in for a rude surprise. Almost weekly I hear stories about people that have “bought” twitter followers – the justification is that they need to appear to have a large following to be attractive to potential employees or clients. I am proud to have “only” 7,100 twitter followers – all organically grown since I joined twitter in 2007. The practice of buying twitter followers is as shady as doctoring your CV, and in fact if you have artificially inflated your social media presence and influence scores, then you have doctored your CV in my eyes. In fact I would refuse to work for a company that relied heavily on my twitter follower number when deciding if they should employ me. As they say – quality not quantity. Turning the attention of this post to employers now relying on single scores on a CV in the recruitment process, I think it is very dangerous to rely on a single score (from any platform). Even if you do have a high score, what does this mean? WHERE you have the high score is what should be important. You turn up at a conference where everyone there has a name badge that just shows their influence score and nothing else. Do you gravitate towards the person with the highest score without knowing anything else about them? So let’s say I go and talk to “Mr 74” – he sounds like he has a good score and must be worth a follow (I mean conversation). Turns out Mr 74 is an expert in sustainable energy – and I am interested in speaking to someone in the advertising and marketing community. Here the score is misleading when used on its own – it shows you have online influence – just not where you have influence. At Kred, our vision from day 1 was that when you walked into that room full of people, you would not only be able to see a two part influencer score (influence AND outreach/generosity), you would also be able to see WHAT I have such a large influence score in. 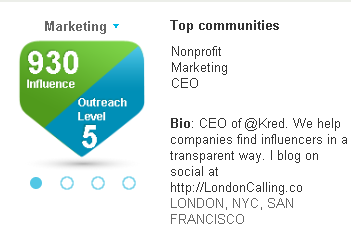 As per my Kred profile below, I would happily display that I have very high influence, and decent outreach in the marketing community. A recent report by Econsultancy titled “Influencer Channels: from Klout to Klouchebag” (free sample available) quoted a number of views from people in the influencer marketing space. While this behaviour may be what our friends at Klout wish to promote, I feel that all influence platforms (including Kred) should come with a section explaining exactly what the score means (Kred’s version of this is at http://lc.tl/kr) and how to interpret it. Sadly, recruitment agencies and HR departments may think that high follower numbers/influencer scores are valuable, and may even overlook better candidates as a result of their influence score myopia. In practice, candidates that simply publish their score on their CV may actually being doing themselves a disservice. Those smarter and more digitally savvy will prove they have real influence beyond just a one-dimensional score, and instead provide evidence to not only explain what influence score they have, but also where they have influence and why as part of an overall pitch for the job. 1D influence scores are so 2009. Kred started with 2D scores in 2011 and if you watch this space, we’re about to tell the whole story in 3D. Employers need to understand the dangers of influence score myopia – http://t.co/IFPqNQ1r a must read. @AndrewGrill yw, you created great source material for a discussion! 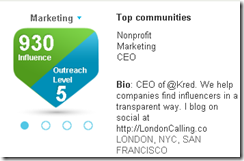 @AndrewGrill what do you think about the Klout changes? @graemeford playing catchup – offline Kred, transparent scores..already in Kred. Wait till you see what we have next! Screen share tomorrow?